Take your taste buds on a trip to Mexico... wait, no Hawaii... actually, maybe it's Vietnam? I took some of my favorite flavors from these three places and combined them to make a delicious little wrap. Crispy, salty Spam is balanced with cool cucumber & avocado, and a sweet & spicy chili sauce. Layered on a simple cabbage slaw and a corn tortilla, this recipe is satisfying and gluten free! 1. Make your slaw first so it has time to marinate. Slice up your cabbage, season generously with lime and pepper, then mix in the cilantro. 3. In a small saucepan, bring vinegar to a boil. Add all dry ingredients to ½ cup of water and stir well. Add to vinegar. Boil, stirring frequently, until sauce thickens. Remove from heat. 4. Slice spam into 8 pieces. Line a baking sheet with foil and arrange Spam. Place under broiler, watching carefully. When the slices are brown and crispy, carefully flip and brown other side. 5. While the Spam is cooking, heat a small frying pan over medium. Heat tortillas, one at a time. 6. To assemble, place a few spoonfuls of slaw on a warm tortilla. Arrange the julienned cucumber and cilantro, then top with sliced Spam. 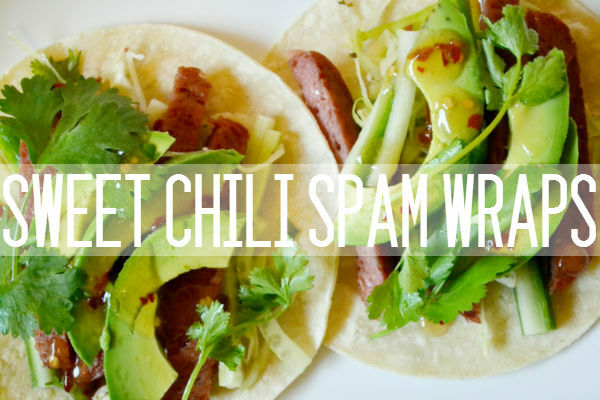 Top the Spam with avocado slices and spoon chili sauce over everything. A very clean and delicious meal. Looks great.